​Game development highlights and insights are featured in this post. Welcome to my game development portfolio! This is where I offer some of my own insights on game development. Please note that any work featured here is mostly work-in-progress and exhibits my skill and progress at the time of the post. Godot is one of many different game engines designed to develop games with. While Godot is no Johnny-come-lately, it is fast becoming one of the most powerful and easiest game engines to anyone seeking alternatives to Unity or Unreal Development Kit. Godot is a free and open-source game engine. While Unity and UDK are also free, your game is good for commercial and non-commercial use. In other words... you own your own game and can financially profit as much as you like for it with Godot. You even can port your Godot creations to a variety of different platforms, including (but not limited to) Android, Blackberry, iOS, Windows Desktop, and more. I honestly never had the patience to try to learn Unity. I felt too lost trying to make even something simple. So when I learned of Godot and saw a number of videos on it, I felt very confident I could finally create some games with it. Try Unreal Development Kit was nothing I was too adept at. And really, UDK seemed slower than Unity, so I retired any such work with the Unreal engine. I had to try to learn Godot first before seriously committing to designing proper games. Both 2D and 3D games can be made with Godot. 2D is easier with Godot than it is with Unity. For my Android ambitions, I am considering a workflow that consists of Godot with my OUYA and maybe even my discontinued Google Nexus Player. I am considering getting a Xiaomi Mi Box to replace my Nexus Player so I can continue to entertain the thought of Android TV game development. The goal is to try to make Android games for Android devices as well as for Android TV. 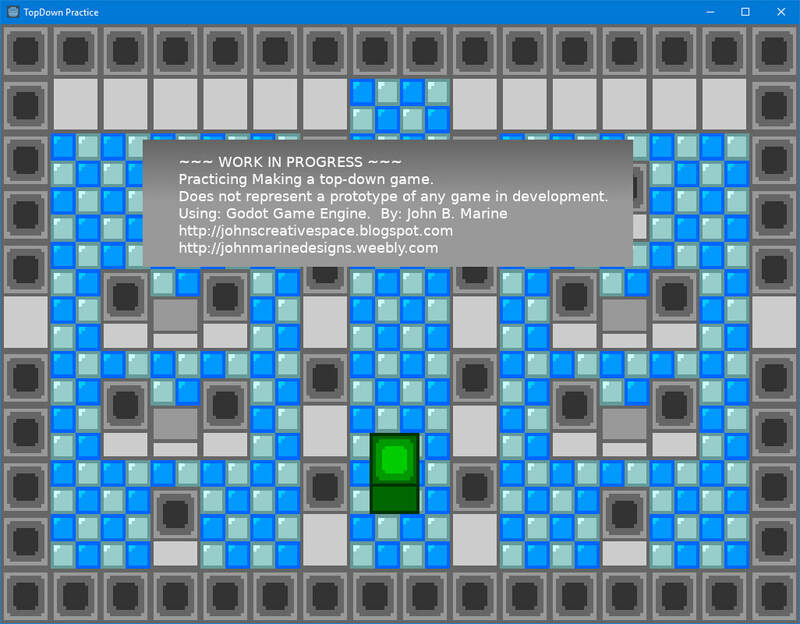 Learn more about the Godot Game engine by visiting godotengine.com . This is me practicing making an Autotile setup. What looks like a well-structured series of tiles designing one level is really just one 48-tile map with 32x32 tiles. Pay no attention to the colored area- that was meant to be a pass-through background element. I used a template to design a series of 47 tiles for an Autotile. Autotiling involves making one tile as the base that can then be used to automatically build levels without having to design everything by hand through a series of carefully-placed tiles. The tiles were all designed in GIMP. I made my own template for which I can envision creating my own Autotile sets for possible gaming assets. Through a series of YouTube tutorials, I practiced making some kind of 2D top-down game. This was my best result after trying so much. Part of my personal Godot training involved making a top-down game. I did have an idea lined up for some kind of top-down game. I put my ideas into practice by learning from a series of tutorials. By now, I have grown to be somewhat confident to make my own game after trying a series of tutorials. It is all about taking what you learned and applying them all to make something special. I am not yet at that level. However, with each sort of tutorial and any other online literature in the realm of tutorials, I am becoming more confident in finally developing and creating my first proper game of any kind. What you are about to see are my own works and thoughts regarding different kinds of material created in Godot. Many people look to the Super Mario Bros. series and Sonic the Hedgehog series as the premier examples of platformer gaming. If you are not a gaming person, a platform game primarily involves going around levels that involve a lot of running and jumping onto platforms. Some even offer elements of puzzles to keep things interesting. While I never really had a proper project lined up for platforming, I have at least tried my hand at learning the Godot engine to make material for it. I am someone who tends to look at little-known or not-very-good games as a basis for trying to create my own content. My platformer insights mostly involve the Mario games and Sonic games. 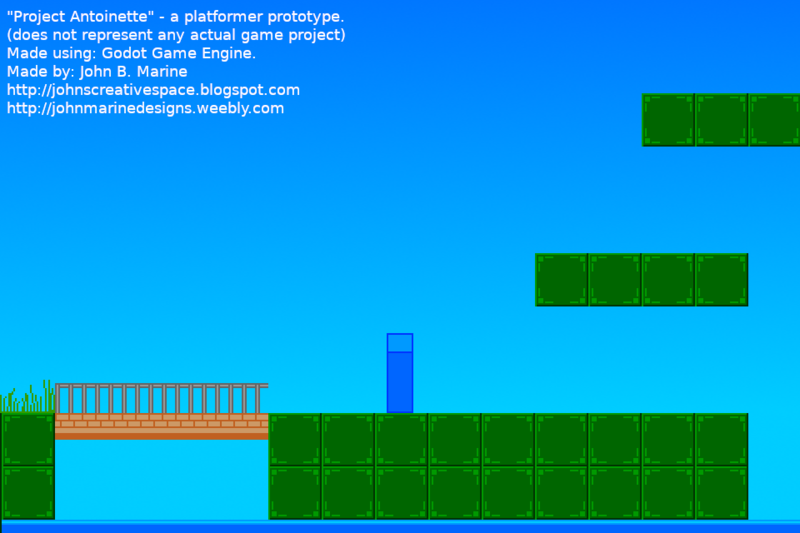 "Project Antoinette" is designed as a prototype towards the development of 2D platformers. I designed this art. A Metroidvania is a gaming term we use to describe games molded along the lines of Metroid and Castlevania. Hence the collective name "Metroidvania." A big part of these two gaming franchises involves enhancing the main character by collecting items and often times backtracking. The one challenge of building a Metroidvania is to make a game that doesn't require the player to backtrack too much to where things get tedious and repetitive. In addition, levels in Metroidvania games are often massive. This is good to provide a maze-like atmosphere and to ensure you don't seem to enter the same places too often. This is a conceptual mockup of "Project Rhiannon." 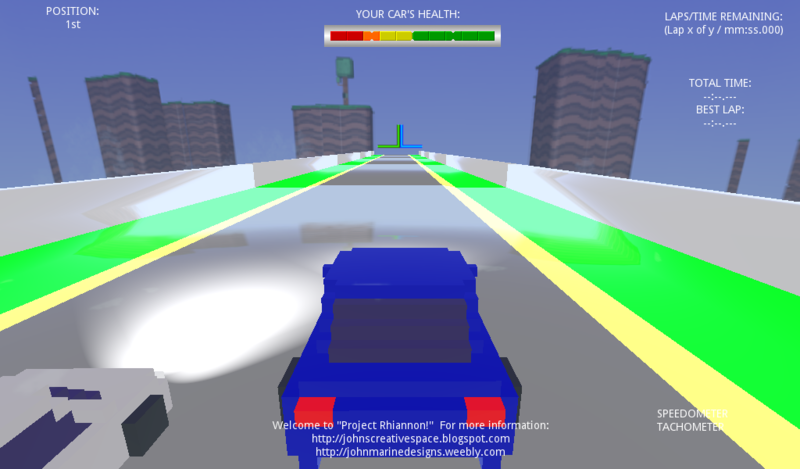 Project Rhiannon is a racing game project. 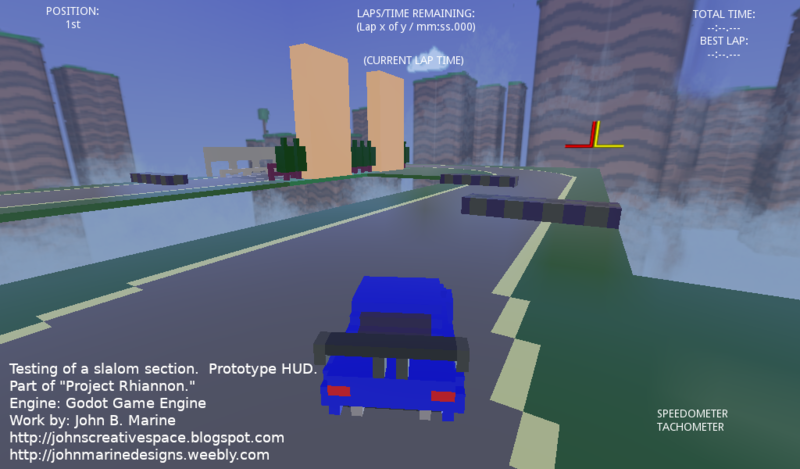 Further progress with "Project Rhiannon" was made as I was better able to make my own driving model as well as better learn the Godot Game Engine. The driving model was based on various Godot projects I downloaded and studied. The real key in learning everything was to learn scripting as well as modifying VehicleBody and VehicleWheel variables. 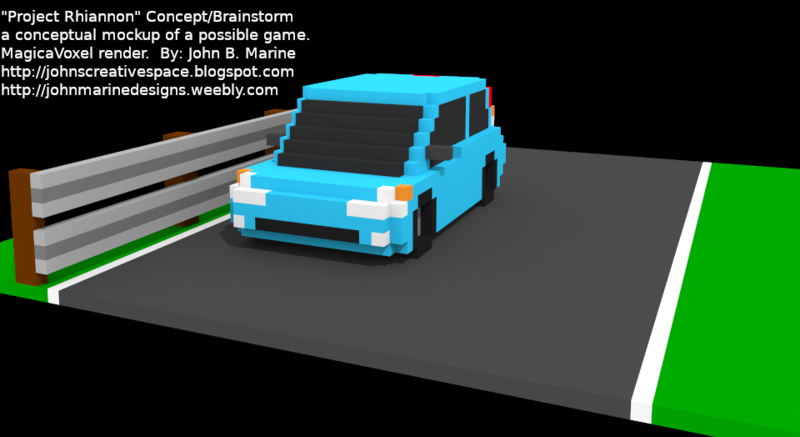 I made both the voxel world model and am using these cars from past MagicaVoxel modeling to get an idea of how to make my voxel world. 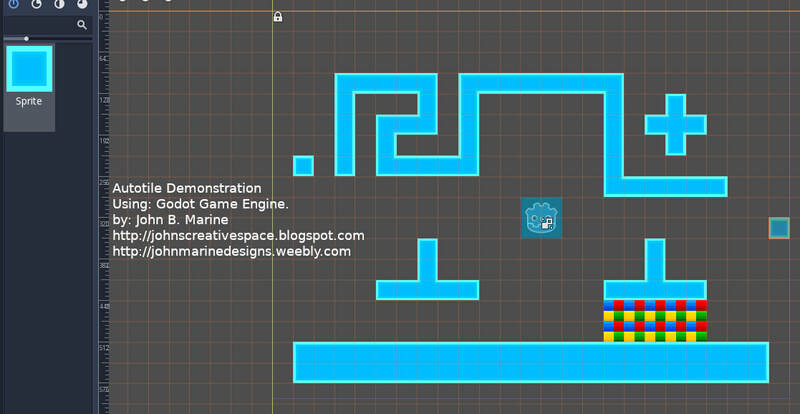 This was one of my first attempts at making a voxel level. The tall buildings were to get an idea of how high I can make things. The largest dimensions mostly are 32^3. Though MagicaVoxel has max dimensions of 126^3, I restricted myself mostly to a maximum of 96^3. However, I do open the possibilities of making proper modular assets to go with bigger size scenery. I am heading into a slalom section I created in MagicaVoxel. This is a road with tire barriers to weave through. Also note the experimental heads-up display (HUD) in this picture. One thing I learned about the VehicleWheel dynamics is that certain variables can totally determine the performance of your vehicle. For example, the Wheel_Friction_Slip variable can be used to adversely affect the handling of a vehicle. I even modified it to where I felt I had more control of a car than usual. However, I also set it a bit to where I had to be careful not to spin the car out. I surely will make various cars of different handling types once I start getting on a roll designing cars through "Project Rhiannon." 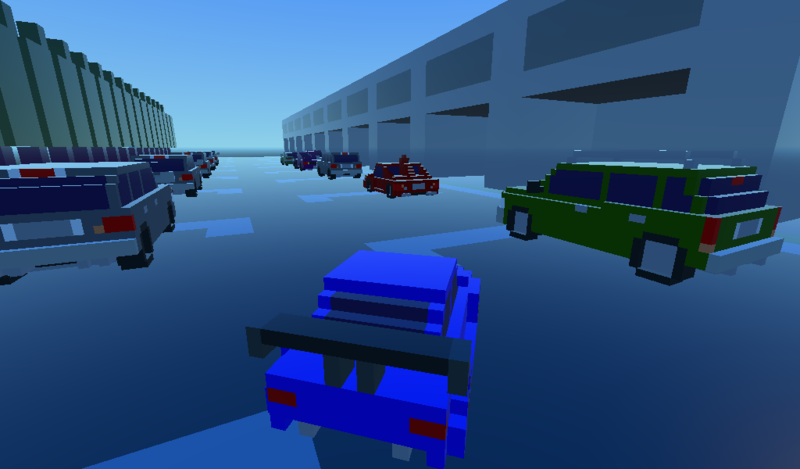 While voxel cars are still used, this picture features a polygon road as opposed to voxels turned into 3D meshes. As I began to try making a 3D mesh of a track, I tried a handful of techniques to try to make some 3D race tracks. I kept my voxel cars because I don't have a proper 3D car to do testing with. So it meant I had to try to learn ways to build a practical race track. A 'practical" race track in this context means something that could properly be implemented in proper games. These include the likes of rFactor, Automobilista, Assetto Corsa, and others. These could also be tracks that can be implemented into its their own racing games. You have to have a certain hierarchy to implement most tracks into most games. 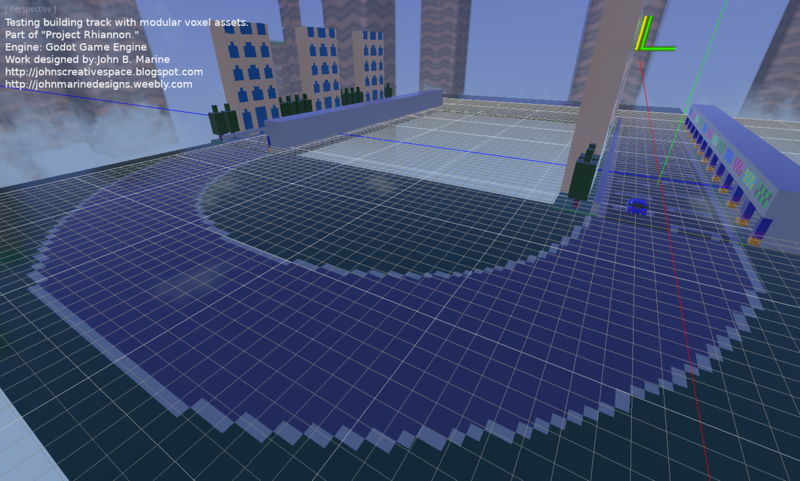 Since I have never designed a proper race track for a game, I had a lot to (obviously) learn. Once I tried doing modular assets, I thought it would be a bit too much work. When I tried to work with Godot Game Engine, the engine has kind of a strange deal of making models fairly shiny. It almost made things a bit like I am racing on rain-slicked roads. Either way, I had an interesting time to try to learn to model a proper race track to race in a game. Do You Want My Gaming Assets?